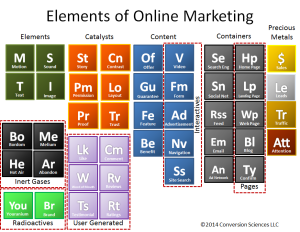 For The Conversion Scientist, it is very simple: Create a hook and use it everywhere. Speaking engagements, your website, your social media profiles, webinars, podcasts, the movies, grocery shopping. Brian Massey devised an inventive way to exaggerate the serious nature of his business without compromising its integrity. 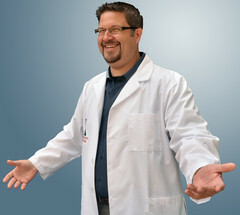 With science on the brain, naturally, he put on a lab coat. “Every headshot I have includes the guy coat,” says Brian. 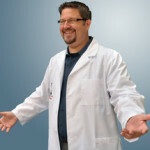 Brian also likes to hand out lab coats to his customers, making them “Honorary Conversion Scientists”. 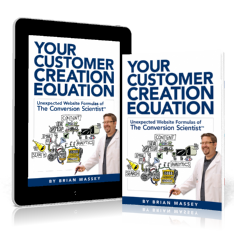 This unique gift turns clients into walking billboards for Conversion Sciences. 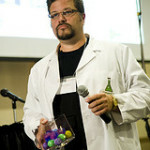 The Conversion Scientist doesn’t stop at just the lab coat. His website, blog site, office, and social media pages are adorned with a science related theme: beakers, bunson burners, and yes, a custom created Periodic Table of Elements for Online Marketing. In fact, the inventive and humorous folks at Grasshopper penned an entire article on the importance and effectiveness of integrating humor into your marketing and branding strategies. Visual Marketing is the discipline of studying the relationship between an object, the context it is placed in, and its relevant image. A great brand is more than a tagline or a popping logo. It’s the purpose behind your business and how your potential clients perceive that purpose. It’s the story that makes you great. Hence the reason the lab coat works. Visual gimmick and imagery is an important part of the marketing world. Remember to throw this into your branding toolkit. To read Grasshopper’s article in its entirety, visit 4Ways to Infuse Your Marketing with Hahas, LOLs, and ROFLs. BTW, get your very own lab coat through our Buyschtuff store today.